The dirt on your cell phone could reveal more about you than you think. 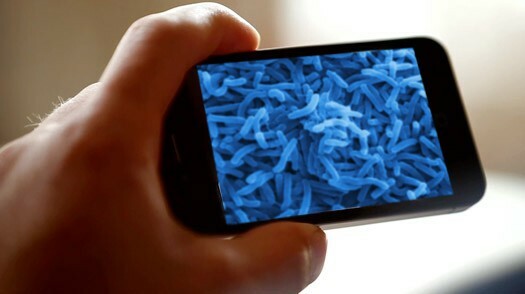 Every time you touch your phone you leave behind a unique mix of the chemicals present on your body and in your environment. Are you a smoker? Traces of nicotine get smeared across the glass. Your brand of laundry detergent, makeup and even the medications you take can all be revealed by testing the surface of your phone. The results add up to a chemical profile which can tell scientists (and investigators) a lot about who you are and where you’ve been. Chemical profiling is the brainchild of biochemist Dr. Peter Dorrenstein and his colleges at the University of California’s Dorrenstein Research Lab. The group conducted a study in which they swabbed the phones and hands of 39 people, then put the results to the test – revealing a wealth of information that included everything from a person’s drink preferences to the amount of time they spent outdoors. The chemical profiling process begins with a mass spectrometer analysis of the hand and phone swabs. Researchers look for chemical compounds common to both sets of swabs, and then put that information through a crowd-sourced database which helps them identify the individual chemical signatures. May of the tiny details of your life are present in those chemical signatures. Dr. Dorrenstein and his team were able to identify medications taken by the participants, the food they had recently eaten and even the places the person recently traveled to. They released the full information in a study titled, “Lifestyle Chemistries from Phones for Individual Profiling” . It’s easy to see how having this type of personal information could be useful in an investigation.Police could obtain a suspects phone, get the information contained within it, and then analyze the external chemical data. Did the suspect visit the woods where the victim’s body was buried? They might not have taken their phone with them – no GPS location – but when they touched their phone after the fact they may have left behind minuscule traces of the environment. Possibly enough to implicate them in the murder. Unfortunately this is still a brand new technology and it is a long way off from being able to be used in investigations, much less the courtroom. Several stumbling blocks remain. What if another person handled the suspects phone and left their own chemical traces? It would be nearly impossible to sort out which chemicals belonged to which person. What if they set their phone down in a cab and it picked up germs from an area they never actually visited? Still, scientists are hopeful that in the future some of these barriers can be overcome, and this technique may one day aid police in isolating which suspects they should consider, and which they should let go. Even further in the future, this technology could become a gold standard like DNA – it all depends on the research of Dr. Dorrenstein and his colleagues.